What interested the PPCC about Mili was not the cliché plot (2) about the boisterous, full-of-life cancer victim who teaches the brooding hero what it means to live. What interested us was that the brooding hero at one point attempts to commit suicide. 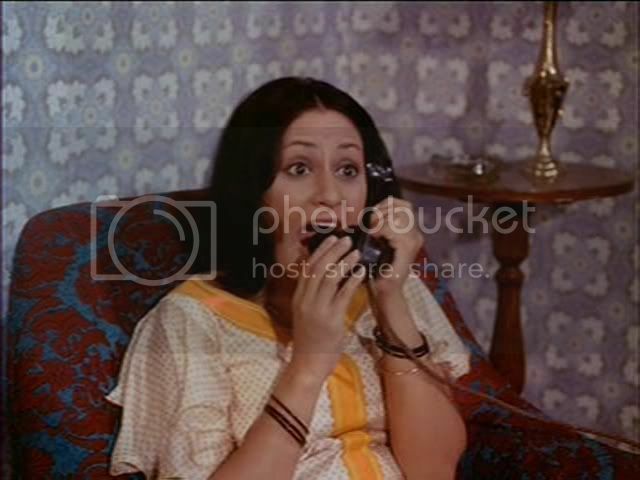 First, we've never seen an attempted suicide on Hindi celluloid. We've heard characters talk about suicide, but they were always accompanied by the Blaring Horns of Taboo. Second, the thematic jumbliness - with one character loving life and dying despite herself, and another character hating it and surviving despite himself - had such an ironic and poignant structure that we thought, This the PPCC must see! 2. New tenant is also hot. Hmm, brooding and yet hot? Angry and yet appealing? Why, it could only be a young Amitabh Bachchan! Indeed, Amitabh moves in with his elderly man-nanny (manny? ), Gopi, in tow, and proceeds to rain on everyone's parade. He does not allow the children to play on the terrace, like they used to. He yells at people. He gets wasted at odd hours and breaks things made of glass. Gosh, if you weren't so tall, dark and handsome, Amitabh, we'd be really annoyed. Of course - and don't pretend you're not just salivating for it to happen! - Mili and Amitabh eventually become close. First, Mili instructs the kids to blast Amitabh with their rays of cuteness, and, despite himself, Amitabh is cutified. Second, Mili is one of the few people who manages NOT to say insensitive things about Amitabh's parents, and Amitabh is duly appreciative. Third, and here's the clinker, one evening Amitabh gets totally wasted and slashes his wrists. Mili and her father are called upstairs by Gopi to help, and Mili has to hold Amitabh's wrist. The next day, visibly embarrassed, Amitabh attempts to recoil back into his shell, but Mili's casual compassion and easy-going optimism break his armor like Saladin breaking Jerusalem's walls in 1187. Soon enough, Mili's coming over to Amitabh's house for stargazing and philosophical conversation, and with time, the two are holding hands. Let's just take a minute: Awwwww! Come on, you'd have to have a heart of stone not to just feel all warm and cuddly by this point! The morning after. Note the parallels in camera angle and sitting positions. The scene is also played very poignantly. Amitabh's a poor, hurt dear. Anyway, it is now Narrative Time for Mili to become very ill, which she does. We don't want to give anything away from now on, but let's say that the dennouement feels very real, and the ending in particular rings true. Expect no melodrama, despite the long illustrious history of Hindi melodrama. Quite the opposite! This film is soaked in emotional realism, even approaching La stanza del figlio at times. Even though Mili does all the things terminally ill people in movies typically do - wearing a brave face, refusing help, wasting away in a Victorian gothic way - it all feels genuinely poignant. Amitabh's behavior is likewise unexpectedly real. Of course, this makes it impossible not to cry, at least a little. We really like Ashok Kumar in paternal roles. It's interesting to watch early Jaya roles. We were first introduced to her in Kabhi Khushi Kabhie Gham and then Silsila, both roles in which she's portrayed as a very conservative maternal figure. Sure, she smiled, but mostly she didn't. What's surprising (and delightful!) is how fun Jaya was back in the day: from her fast-talking tough girl in Zanjeer, to the perky (in a good way) Mili, to the bit in the flashback in Sholay. It was like she was another person! Small, vibrant, excitable, and indeed a perfect foil against the tall, unmovable broodingness of Amitabh. I guess they've both mellowed considerably now, it makes you forget what a great duo they made back in the day. Onto Amitabh. Well, he was as expected. Angry with a heart of gold. Tall, dark and handsome. We miss Shashi. But I guess you can't have everything. What's especially interesting about this film is that it's almost like a proto-Parallel Cinema film - intelligent, subtle, real - and yet it's so, well, mainstream. But it's the type of film that the PPCC expected Naseeruddin Shah and Shabana Azmi to make (and, indeed, they too have covered the territory of health and romance and suburban India). It's also astoundingly short, coming in just under the 2 hour mark. Use this to ease your non-Hindi friends into the powers of Amitabh and Jaya. Edited to add: OK, so Prof. Lutgendorf's review of Anari cleared a lot of our misunderstanding re: this film. Like Anari, this film was directed by Hrishikesh Mukherjee, who specialized in "middle class" films - not quite bombastically populist like the good ol' masala movies, but neither quite so cerebral as Shyam Benegal and the Parallel crowd. Ooh, got it. I've only seen two HM films and they were both superb, somehow filmi in all the right ways without being too much (even though I usually enjoy too much, it's nice to get other things I love about typical Hindi films in a different sort of way). Also, I want to live in an apartment building in which gossip meetings are called. And probably when I'm 70 I'll be the person doing the calling, let's be honest. I love this film, it's one of my favorite HM ones. Jaya is just unbelievable. She is so sparkly and full of life in these early films (in addition to the ones you mentioned---Guddi! A must-see). This is such a cute film, but Jaya does o'd on the squeee moments, but great otherwise, and Amitabh is so smoldering and full of injusticeness! great review! Jaya was really good in her younger days - Mili, Guddi, Chupke Chupke, Anndata, Parichay - had her looking so cute and bubbly. Seems like she's making up for it by being ultra conservative and gloomy in all her roles! Oops. That last sentence should read: Seems like she's making up for it by being ultra conservative and gloomy in all her roles these days! I love this movie and it was my first HM movie years ago. I saw 'Abhimaan' soon thereafter (which quickly became one of my favorite movies of all time) - his movies are just so sweet and real. His movies are right around 2 hours and pack more into them than some movies do in 3 1/2... Jaya was just grace personified in this movie and people who know her from the 'Kabhie Kushie Kabhie Gham' period really need to go back and check her out at her zenith. And of course I couldn't leave without mentioning the subdued but brilliant songs. The Lata number 'Maine Kaha Phoolon Se' and the Kishore song are both just wonderful. Beth - I agree! They occupy a very fertile middle ground, and I think they'd be excellent introductions to Hindi cinema for non-Hindi people. Ain't nothing wrong with calling meetings for purely gossip purposes. Memsaab - Ahh, young Jaya! She was so different back in the day, wasn't she? Ooh, Guddi's on my list now - I just read a review of it over at Filmi Girl, Bol! It looks excellent. Shweta - I am the EXACT same way. We can assume the ending is happy together. Rum - Welcome! Yeah, Amitabh looks like he's about to catch fire, what with all his smoldering hotness. The PPCC is a BIG fan of Byronic heroes, so we loved him immediately. Agreed that Jaya squees up a small storm, but I began the film VERY wary of too much cuteness and generally came away satisfied. Like, she's excitable, but she's not inhumanly excitable. Bollyviewer - I sometimes wonder if it's the "Married Actress" cinema which I've heard so much about. Perhaps in an effort not to look like a potential floozy, she decided to go uber-conservative? If I was really clever, I would know when the Bachchans got married, but I don't, ergo I don't know if I have any basis to believe this. Sanket - Sweet and real is a perfect way to describe them, true! And agreed that Mukherjee was an incredibly efficient director, not only compared to the Hindi mainstream norm, but also compared to European films. Actually, Mili is a lot like Nanni Moretti's The Son's Room - both deal with similar issues and use similar styles(evocative and vignetty). Guh. But when Amitabh goes to visit Jaya when she's stuck in bed? It's like they pulled my heart out. Anamika and Kora Kagaz are the other movies in which Jaya did an excellent job. Do check out Koshish if you can. Directed by Gulzar and starring Jaya B and Sanjeev K. They portray a deaf-mute couple and act up a storm. Great movie. Jaya was The Heroine for a lot of us teens back in the 70s. All those of us who couldn't digest masala, and didn't like to simpering, over-dressed heroines (however beautiful), self-sacrifycing doormat (however lovely) and the eternal message of women as decoration doll. She was a breath of fresh air, she looked like a Real Person, had personality and could actually act! She couldn't dance to save her life, wore sarees wrapped round. There is that scene in Bawarchi where she is supposed to dance, and you can see how they worked round that one! But we all lvoed her and she was a Star, v v popular. And did not hesitate to remove make-up and look ill when called to do so. When you saw her and esp in her interviews, you can see why BB and others would be captivated by her, she is certainly got an intelligent mind of her own. I believe HM's films got a new lease of life from her, and in a way her being able to be a star starring these supposedly modest films, allowed directors to make more films of this type, knowing they would be successful. I recommend watching most of her films, from Guddi, Uphaar, Koshish, Anamika, Parichay, Kora Kaagaz, Piya Ka Ghar, Abhimaan, Bawarchi, etc. etc. Except her Gau and Gori, which is a total embarrassment acc to her! Coming back to Mili I often feel that the blurb does not do any justice to the film (oh another dying role) because it is totally something else. Everything is so real, we didn't live in an apartment building, but around 4-5 pm was tea-time before husbands came home, and many days neighbouring ladies would drop in for tea and we would be crowded in my parent's bedroom, listeing hard to gossip and complaints! You have reviewed it beautifully, but my best dialogue is when Jaya starts feeling more under the weather and tells Ashok Kumar"..battery recharge ka time ho gaya..." all the story and emotions and feelings behind those few words. Jaya was truly one of a kind and Amit in those days was a real charmer. But HM is the real star of this movie. When I see the movies made today, with the helicoptering, multi-zillionaires and other such blather, I yearn for a return to sanity, for the types of movies HM made. Incidentally, you can watch Mili and other HM movies on moovieshoovie.com, of which I'm the founder. All movies are subtitled and DVD quality. Love to see you all there ! Ahh I was watching this movie one night and got really sleepy and didn't get to finish it :( I can't find it anywhere nearby either! Does Mili die in the end or does the film not go forward to that part? I thought it was soo good and I really wanna know the end! btw ppc your blog is fab :D So much variety!